Tilicho Lake is situated in the highest altitude of the world with an elevation of 4,920 Meters. Tilicho Lake Trek is a part of Annapurna Circuit Trekking. It offers a classic adventure journey to Tilicho Lake – a serene turquoise lake situated in the high Himalayan region of Manang region. Tilicho Lake is also widely well recognized as a holy spot mentioned in the Ramayan – a popular religious book of the Hindus. The trek gives magnificent views of major peaks of Annapurna Himalayan range – Lamjung Himal 6932m, Annapurna II 7939m, Annapurna IV 7525m, Annapurna III 7555m, Gangapurna 7454m and other snow-capped peaks. On the way to Tilicho Lake Trekking, you can have the experience to explore the Tibetan villages with unique cultures and traditions which can be a lifetime unique experience. The crossing of the challenging Mesokanto La Pass 5120m also known as Tilicho Pass is another feature highlighted in this Tilicho Lake Trekking. However, the diversity in the landscapes, temperature and the people that change every few days makes this adventure trek exceptional. 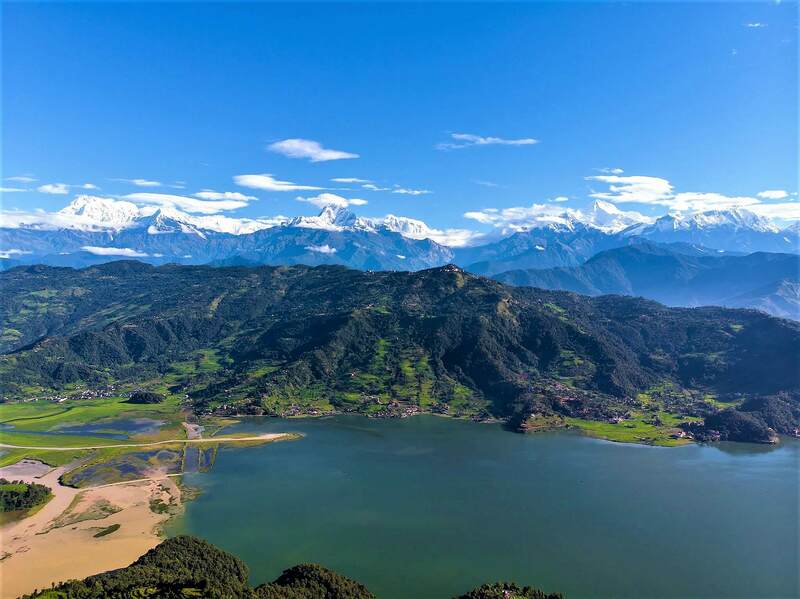 This trek begins with a scenic drive from Pokhara to Chamje passing through beautiful Pokhara- Kathmandu Highway. We start our trek from Chamje, the trail leads to a slow climb most of the way following the raging Marsyangdi River upstream all the way to its source at Manang and beyond. We take a rest day at Manang for acclimatization and exploration of the surrounding areas. After Manang, we follow the North West route and heads towards Tilicho Lake Base Camp and Tilicho Lake. The glacier lake is a serene turquoise color lake at 4920 meters enclosed with high peaks of Tilicho and smaller snow-capped mountains. After exploring the Tilicho Lake heads for the crossing of the challenging high pass Mesokanto La at 5120m then down to Chauri Kharka. From there, our trek descends downhill towards Jomsom. Amazing trekking experience at Tilicho Lake ends with the scenic flight from Jomsom to Pokhara and drive back to Kathmandu. We drive from Pokhara to Chamje via Dumre. From Dumre we continue our drive following the narrow and paved road by the side of Marsyangdi River to reach Chamje. During the journey, you can enjoy the natural sceneries and observe the daily activities of the local Nepali people. We start our trek from Chamje following the trail through sub-tropical lands towards a small village called Tal located near a large waterfall. We continue our trek along rhododendron, bamboo and pine forests passing through Dharapani, we head towards Bagarchhap. From Bagarchhap we make a steep climb through the beautiful Rhododendron forest. we will have great panoramic views of Annapurna II 7939m, Annapurna IV 7525m and Lamjung Himal 6983m during our trek that leads us to Chame. We follow the trail by crossing the Marsyangdi river bridge and then we trek along the left side of the bank. Passing through Talekhu and Dhukure Pokhari we follow the narrow and stone paved trail to reach Pisang. We have 2 different walking route splits from Pisang to Manang. The upper route follows high altitude level and lower route follows quite lower. On the way, we will visit a monastery. Upper route contains much panoramic scenery of Himalayas than lower route. Spectacular view of Annapurna, Pisang peak and many other snow-capped peaks adds extra pleasure for today’s walk. It is very important to take a day rest for acclimatization in the higher altitudes. Besides, Manang has a lot to offers for the visitors. Manang is a medieval, Tibetan-style village where there are many teahouses and campsites. The best view of Annapurna II 7939m, Annapurna IV 7525m, Annapurna III 7555m, Gangapurna 7454m, Tilicho Peak 7134m and other snow-capped peaks can be seen right in front of us. We leave Manang following the trail that demands elevation all the way up to Khangsar. We cross through the Khangsar Khola bridge to reach Khangsar village following a rather easy slope. We follow the trail through various ice lakes and glaciers towards Tilicho Base Camp. During our walk today, we have more chances of seeing wild animals. We camp at Tilicho Base Camp. Today we start early in the morning, a steep climb through the icy trail of the mountain leads towards Tilicho High Camp. We now are close to Tilicho Lake at the altitude of 4920m, so there is maximum chance of altitude sickness. It is necessary to acclimatize and be prepared mentally and physically for the crossing of Mesokanto La pass at 5121m the next day. Today we can explore around the Tilicho Lake and the moraines formed by the glaciers in its vicinity. We start early in the morning for the successful crossing of Mesokanto La Pass. As the crossing of the pass is difficult we need to check our gears properly. The crossing of the pass requires around 4 hours of walk. We then enter into Mustang District after crossing the pass. Since there are no tea houses and lodges available in this area we tent for the overnight stay in Chauri Kharka. From Chauri Kharka we follow the trail declining all the way to reach Jomsom. Jomsom is an important hub for Mustang and Upper Mustang Treks with the airstrip, abundance of tea houses and services. Early morning we will drive the beautiful Kaligandaki river valley from Jomsom and coming to Pokhara. This will be a fantastic ride with the great view of Himalayas, deep rivers and see the rural Nepal. Transportation cost from Jomsom to Pokhara.